Dark and brooding, Picaza is a new creation by The Inamorata Dance Collective, bringing together contemporary and flamenco dance. Their performance was stunning with one dance that is imprinted in my mind. Using a long white piece of translucent fabric, the entire cast dance with it as something between a partner and a prop. They weaved in and out, stretched it, used it for restraint. It also became a screen and the red lighting caused their bodies to be silhouettes. To say the least, this act was breath taking and haunting. Alone, it was enough to make the ticket worth while. The artistic consistency of the piece was phenomenal. Choreography, costumes, lighting and music all worked together for an exquisite experience. The only times when my attention slightly waivered was a rare moment when the choreography was too difficult for the dancers. Still, this is a wonderful dance and a collective to watch out for. The “F” Word opens with a mini-monologue about women’s power and they hold to that theme. The literal interpretation of feminism is clear and almost refreshing compared to very abstract dance shows. The 10 ladies get political, dancing out their rage about President Trump, or kick it 50s style with a tribute to secretarial staff. The choreography is solid through the entire piece but the I’m Your Venus being a highlight. A spoof on women’s razor commercials, the dancers wore swimsuits and then plastic bags while using a pink razor as a prop. It felt intentionally exploitive and had a discomfort that reflect our changing times. Am I Pretty Now? is an autobiographical musical of Stephanie Herrera’s struggle with her body image over 40 years. It was one that I was looking forward to and didn’t quite hit the mark. When Herrera was funny, she was hilarious but when she wasn’t…. Still, her showgirl style was endearing; her monologues, especially the final one, were charismatic; and her accompanist was a joy. This is proof that good dancers can do bad dances. 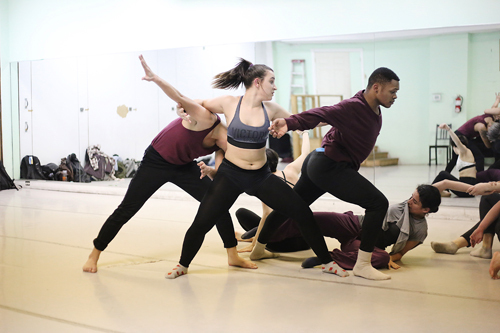 It was very apparent in Home Again by Heather Eli and Dance Company that the cast was extremely talented but the material they were working with was underwhelming. There were moments of impressive acro dance and intricate hand movements but it was between long stretches of mediocracy. When a contemporary dance version of red rover was done to show a return to childhood, I was shocked and not in a good way. Thematically, the show was about making a home wherever you go but the artistic decisions felt random and scattered. I’m not sure why the male dancers wore dresses or why the entire cast had boxes on their heads. Neither added to the aesthetic that was being created. This is a show that needs to go back into studio for more research. NEW THIS YEAR: Fringe Bingo! Head to our Instagram, Facebook or Twitter accounts to download one of our custom Toronto Fringe Festival bingo cards and cross off classic Fringe tropes and experiences to win great prizes like Free Drinks and Free Tickets.